Magic Garage Doors is the local professional garage door repair service you can count on. With over 10 years experience we offer fast and dependable garage door service to customers in West Hills. Our technicians are factory qualified. They know all the major manufacturers parts and how to repair them. They are competent enough to take care of any problem you may have. We can repair your garage door torsion springs and will fix all the problems related with it deteriorating. If you are like most people, you probably don’t even know where your torsion springs are. The torsion springs are the parts that lift your 400 lb garage door easy enough that you can do it with one hand. Most people never think about it but their garage door is the heaviest moving part on their home. It moves easy when the torsion springs work. 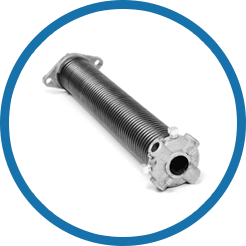 Call Magic for torsion spring repair and we will inspect the torsion springs. We make sure any trouble you are having with your garage doors is detected and repaired. Some ordinary signs of damaged torsion springs can be when your garage door opens lopsided when you try to move it. Another sign is the door doesn’t open more than a few inches. When there is a problem with the springs, occasionally homeowners try to fix the springs themselves. 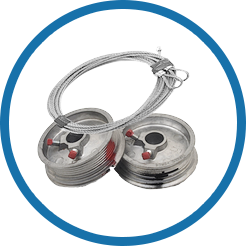 Because the torsion springs can let loose with over 500 lbs of immediate energy directed when released improperly, it’s better to let professional trained technicians handle it. Under normal wear and tear, the torsion springs wear down at the same time. Typically they break close to the same time because of this. When one is broken, the other needs replacing. The normal life of torsion springs is about 6 years. We can provide a maintenance service contract that protects you from this kind of problem because we inspect both springs and will change them out when too much wear occurs. Our technicians see the signs of wear and tear while they examine your springs. Magic garage door repair company keeps a complete line of manufacturer approved replacement parts. All of our technicians’ credentials are for installations, service, and repair. With their proficiency, our technicians have really built our referral business. Our customers love them. They are considerate as well as professional. Call Magic because a broken torsion spring can cause a lot of damage to your garage door if it breaks loose. Keep in mind, if the tension releases by mistake the torsion spring can cause serious injury and result in death. The force on the springs average 500 lbs. You’ll know when your torsion springs are broken or worn out because your door opens irregularly. This can really harm the garage door panels and other parts. If you find you are having a problem, call us to replace it. Our technicians have what it takes to ease the pressure in the torsion springs. We make the repairs and mitigate further damage to happen. We fix and replace every garage door part that needs it fast and professionally with factory approved parts. Your garage door torsion springs are mounted to brackets through the non moving anchor cones. The anchor brackets fasten to your garage walls and at the other end of the spring is a winding cone. It is used for installing, uninstalling the spring, and to adjust it. The springs are loaded with force and that is what opens and closes your garage doors. Repairs and service done by a capable technician and unique garage door tools make sure the repair is done right. During installation or adjustment of the torsion springs you need to have a qualified technician doing the work to keep it safe and make sure it’s done right. The lower end of the garage door cable moves your garage door up as the cable drums put out the force from the shaft. The shaft runs through the torsion springs. It releases the force when the drum is active. The cable drums pressurize the bearings. The end plates rest against the shaft. The drum has coils wrapped around it. With just this brief overview it is easy to see why it takes a qualified technician to sort this out. If you use the wrong tools or substandard parts, the weight of your garage door can cause the torsion springs to break again. Bear in mind, the force from the springs could be detrimental to your health and safety if you try to fix your garage door torsion springs. Call us for garage door torsion spring repair. We offer 24-hour a day service for garage door spring repair. We’ll give you better garage door repair services than you can get with any other repair company in your area! Our technicians also recommend pointers for maintenance if our customers enjoy DIY projects from time to time. Call Magic today!